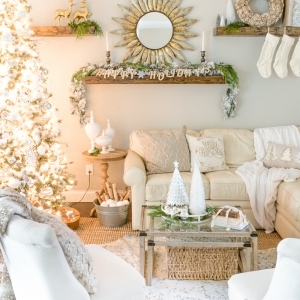 Beautiful silver and gold christmas tree inspiration, perfect for neutral Christmas decor. I love to alternate my Christmas decorations each year between traditional reds and greens and soft neutrals. Last year I embraced red plaid, and this year I’m embracing silver and gold! I adore both looks and think it’s fun to mix it up each year. 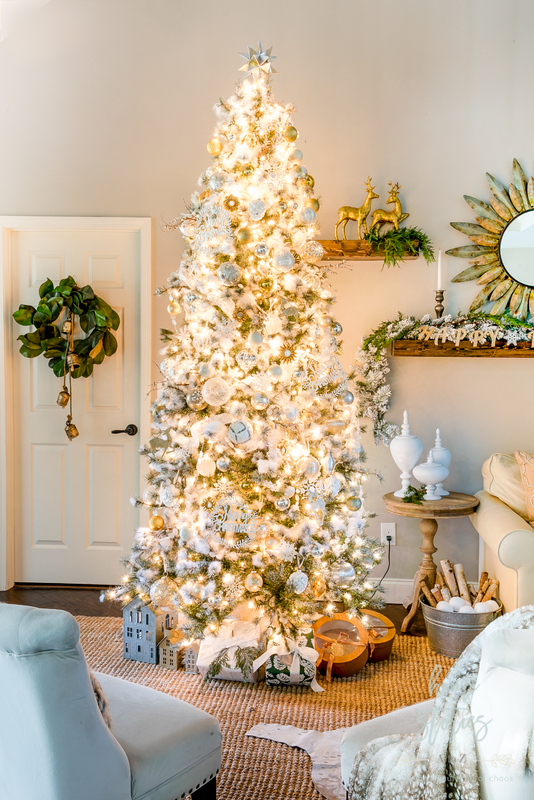 Today, I thought I’d give you a few tips on how to decorate a dreamy silver and gold Christmas tree. 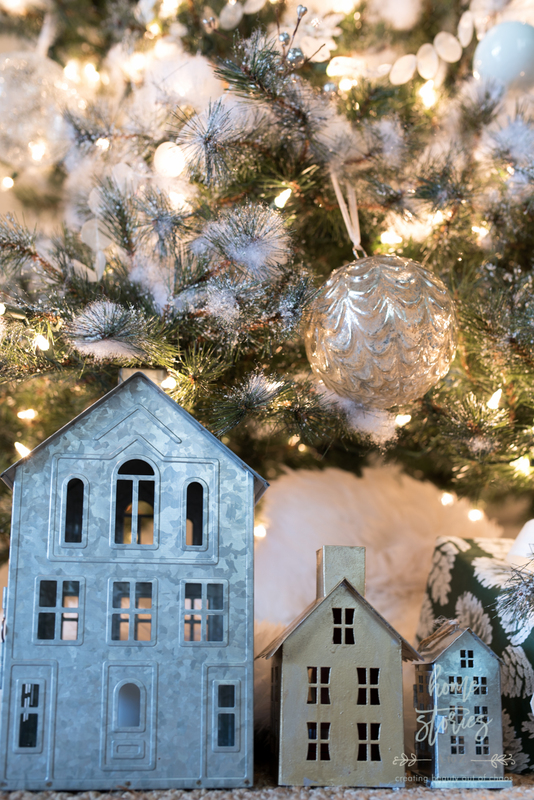 Tree Decorating Tip 1: Use polyester stuffing to create a flocked look on your tree. Below is a picture of my in it’s “before” state. My tree is lightly flocked, but I prefer a more heavily flocked look so I cover it in stuffing. Using polyester stuffing such as Polyfil on Amazon, you can easily achieve a snowy look! Simply place the filling on the tips of your branches to create as much snow as desired. Tree Decorating Tip 2: Start decorating the tree with your largest “hero ornaments” first. It’s a good idea to begin decorating your tree with the largest ornaments first. I have a beautiful collection of large mercury glass ornaments that I like to use each year. I place my ornaments in a zigzag pattern working up the tree. I also like to add a few oversized signs or ornaments to the tree. These cute Merry Christmas signs are a fun touch. 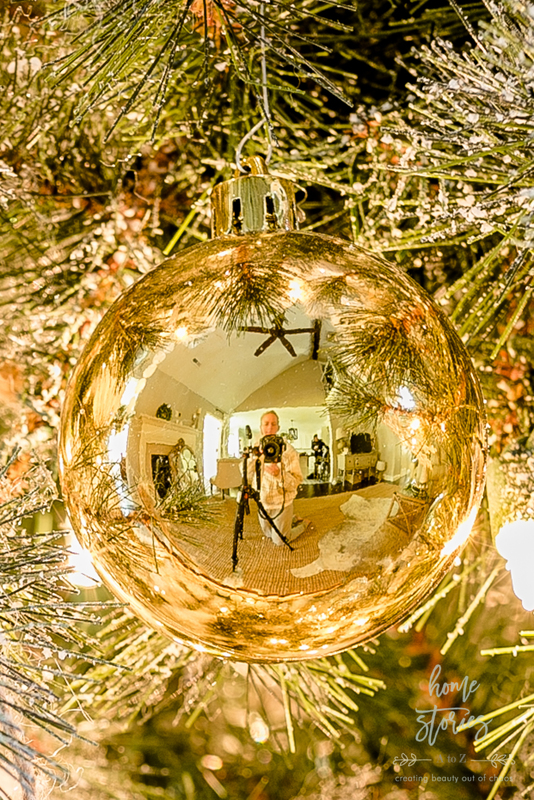 And do you see my reflection in the gold ornament? Here you go! Now you can see a little bit of the behind the scenes that I share frequently on my Instagram stories! Tree Decorating Tip 3: Use strips of ribbon and garland to add “wow factor” to the tree. My favorite Christmas trees almost always include ribbon! 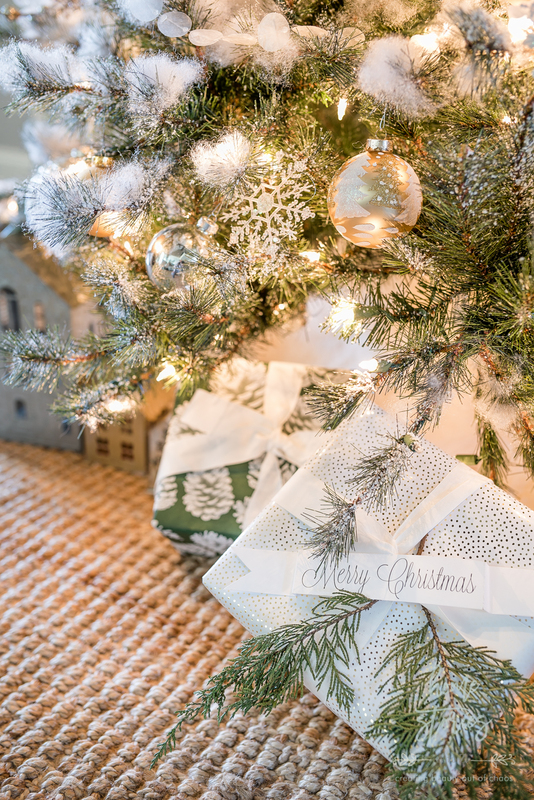 To make it easier to work with, cut your ribbon into three foot lengths and tuck it into the tree as desired. 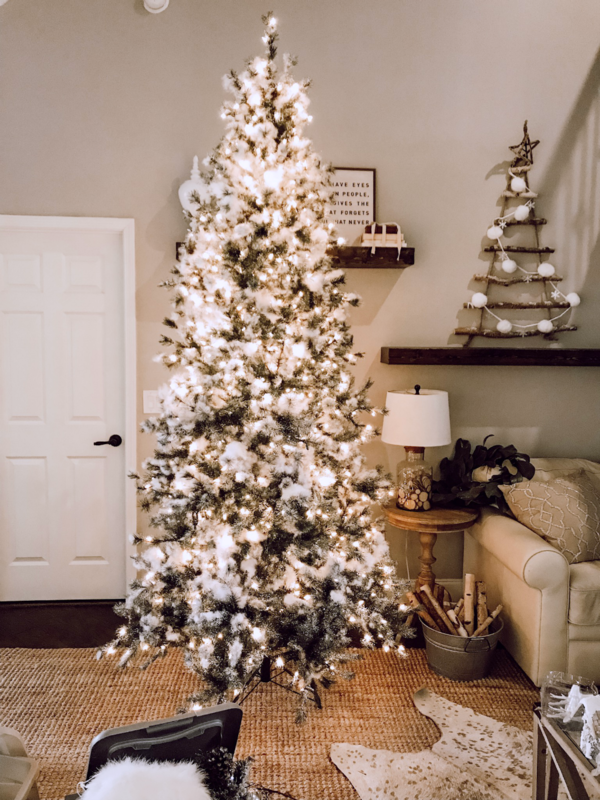 If you look closely at the picture below, you can see that I used a few strands of white ribbon as well as my waxed paper capiz shell garland on this tree. 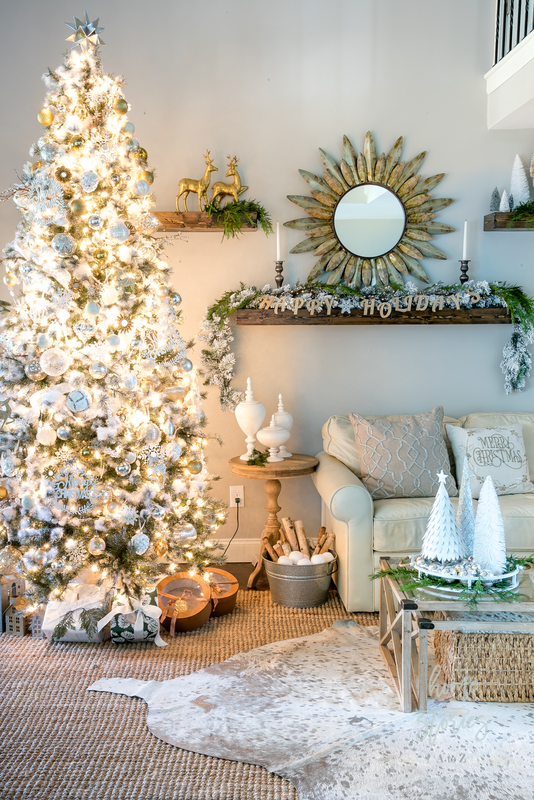 Instead of neatly running the ribbon or garland around the tree, consider weaving it in and out to create a unique look. I love how the waxed paper garland magnifies the Christmas lights and adds an additional layer of beauty to the tree! Tree Decorating Tip 4: Decorate underneath the tree. 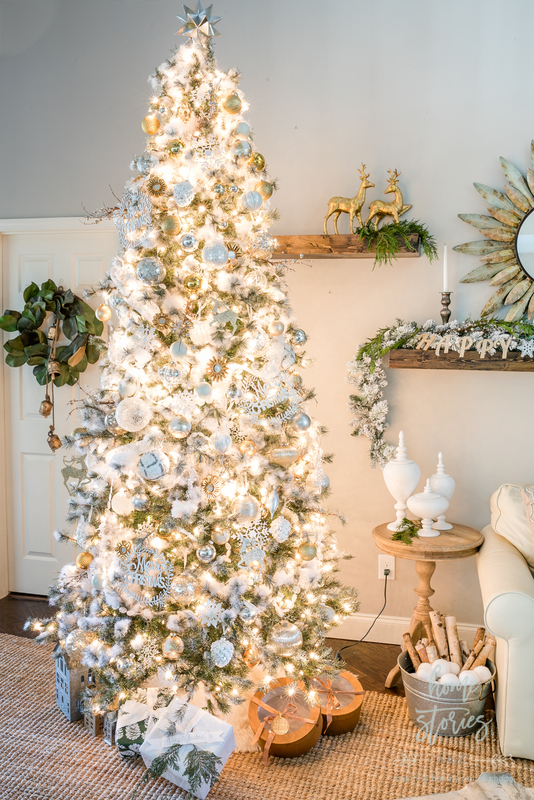 Decorating at the base of your tree really completes your look! If you already finished your Christmas shopping, feel free to wrap a few gifts and stick them under the tree. If not, consider using lanterns, baskets filled with throw blankets, toss pillows, and nostalgic toys (think rocking horse or vintage truck) to fill out the base of your tree. In addition to some wrapped presents, I used a few of my galvanized houses at the base of my tree. 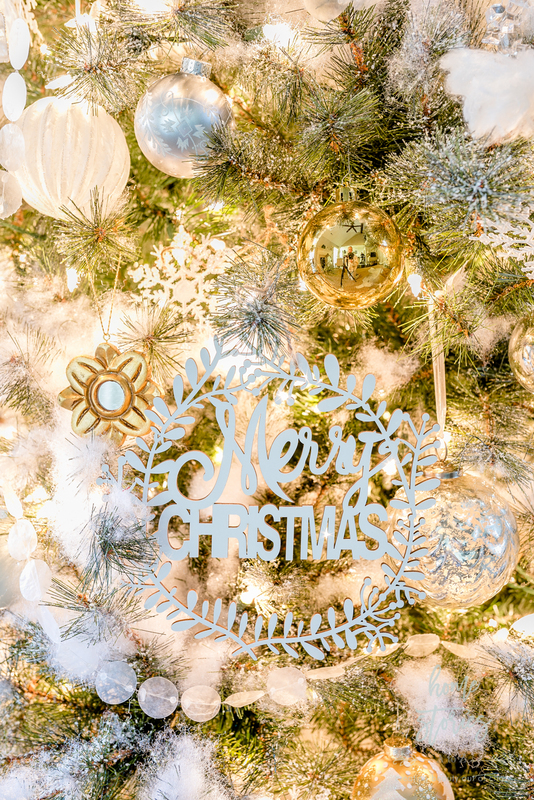 Enjoy the cozy warmth of your beautifully decorated tree! Thanks so much for stopping by today. 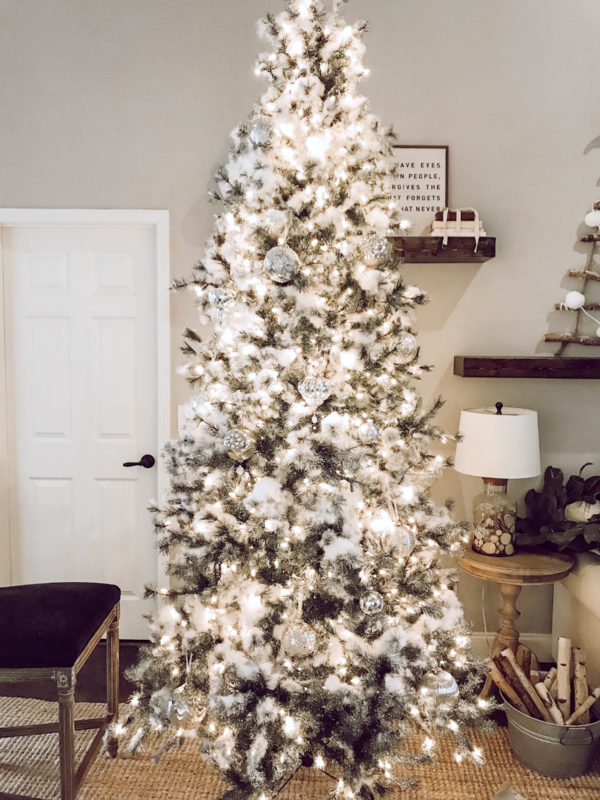 For more beautiful Christmas tree inspiration, please check out the posts by my blog friends below! Hi Beth, I was wondering what color you used on your walls here? Its beautiful! Enjoy your blog immensely, and thanks for showing me a new side to Walmart, Saves me tons of money and still looks beautiful! Thanks again and a very Merry Christmas to you and your family! Thanks so much Kara! I appreciate you stopping by and taking the time to comment! The walls are a custom blend created by the previous homeowners and I unfortunately don’t have the formula. However, I have a good eye for color and in my opinion it’s incredibly similar to Sherwin Williams Agreeable Gray.